The cantilevered space is compact at just 1026sf but feels larger due to its height and the walls of glass that open to expansive views. The Allyn Morris Studio has a two story living room, dining and kitchen area with the master bedroom on a mezzanine. 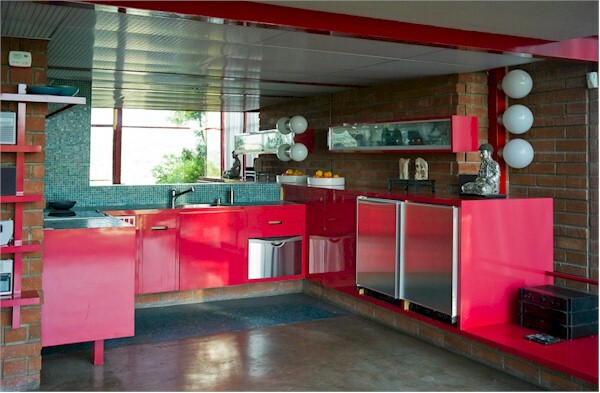 There are bright red accents throughout the house not only in the steel framing and and railings but in the kitchen and furnishings as well. The master bedroom loft space is reached by a spiral staircase of steel. 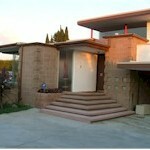 The staircase itself as visible from inside as well as outside the house is a design statement of its own. 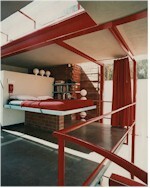 The lower level had been used at the architect’s studio but could certainly serve as a second bedroom for its next owner. It’s unassuming street view of brick and single carport has changed little since the house was built in 1958. The interior of this Silver Lake Architectural retains many original details from bathroom fixtures to mosaic and brick work. Stepping into the home is like stepping back in time. Though the original kitchen of the Allyn Morris Design Studio was demolished, the updated kitchen remains true to the original design and Morris provided advice and supervision during the remodeling. 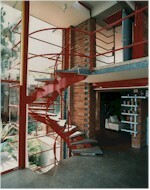 The cabinetry was painted a bright red to match the spiral staircase and other design elements of the house. 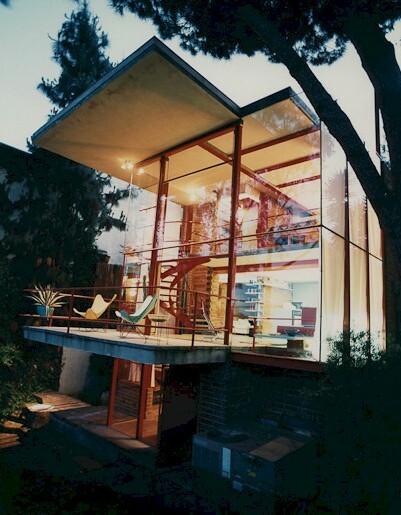 The first home he built was the was the 1956 Max Bubeck house in Eagle Rock- another multi-level minimalist design of steel, concrete, and glass. Allyn Morris designed a number of inventive houses, apartment buildings, offices and shopping center. 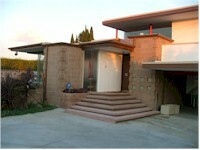 Most of his work included modern properties built in the 50's,including the Echo Park apartments which have been converted to the condo complex known as Lago Vista. 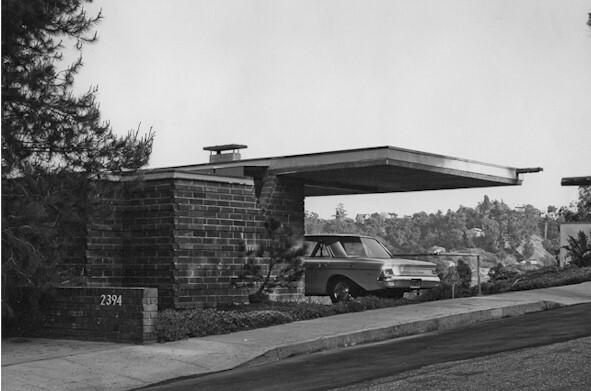 More information about the architect can be found online as well as in in publications such as “A Guide to Architecture in Los Angeles & Southern California” and “ Forgotten Modern: California Houses 1940-1970” by Alan Hess, available at Amazon. As for the Allyn Morris Design Studio, it is currently listed with Crosby Doe at $668,000 and sure to garner its share of attention. I'm really enjoying your posts. I wish you would add blogs more often. Merrill, I am working on being more consistent. It can be tough to keep writing when I get busy with clients but it's definitely on my to do list!